WASHINGTON (CNN) -- Hate crimes experts and law enforcement officials are closely watching white supremacists across the country as Barack Obama prepares next week to be sworn in as the first black president of the United States. 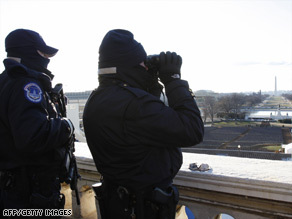 U.S. Capitol Police check observation positions in advance of Tuesday's presidential inauguration. So far, there is no known organized effort to express opposition to Obama's rise to the presidency other than a call by the National Knights of the Ku Klux Klan for its members to wear black armbands as well as fly the U.S. flag upside down on Inauguration Day and Obama's first full day in office. As Tuesday approaches, when Obama stands outside the Capitol to take the oath of office, experts expect anger about the new president to spike. But they don't expect it to go away. "The level of vitriol, I expect, will go up a bit more around inauguration time," said Brian Levin, director of the Center for the Study of Hate and Extremism at California State University-San Bernardino. The inauguration of the nation's first minority president increases any potential threat, "particularly stemming from individuals on the extremist fringe of the white supremacist movement," said a recent intelligence assessment by the Department of Homeland Security and the FBI. But law enforcement has the appropriate resources to respond if needed, Persichini said. "We have seen a lot of chatter," Persichini said. "We have seen a lot of discussions. We have seen some information via the Internet. But those are discussions. We look at the vulnerabilities and whether or not the groups are taking action. "You have freedom of speech," he added. "Anyone in this nation can have a discussion about their beliefs, but we are concerned about whether or not they take that freedom of speech and exercise some act that is against the law." Three New York men were indicted on charges of conspiracy to interfere with voting rights -- accused of targeting and attacking African-Americans in a brutal crime spree soon after Obama was declared the winner on November 4. And interest in racist ideology was so high right after the election that computer servers for two White supremacist Web sites crashed, according to the Southern Poverty Law Center, which tracks hate groups. But the violence and interest soon subsided. Leaders within the white supremacist movement are now seeking to capitalize on Obama's presidency by using his election to help grow their organizations. "President-elect Obama is going to be the spark that arouses the 'white movement,' " reads a posting on the National Socialist Movement Web site. "Obama's win is our win. We should all be happy of this event." In an interview posted on his Web site on election night, former Louisiana state Rep. David Duke said Obama's election "is good in one sense -- that it is making white people clear of the fact that that government in Washington, D.C., is not our government." "We are beginning to learn and realize our positioning," Duke, a prominent white supremacist, later said in the election night recording. "And our position is that we have got to stand up and fight now." Mark Potok, director of the SPLC's Intelligence Project, said the leaders of these groups are frustrated by Obama's win. "I think the hate groups are desperately looking for a silver lining in a very dark cloud for them," Potok said. While experts said it is difficult to determine how many people belong to hate groups, they do agree with an SPLC estimate that claims there are about 900 operating now, a 40 percent increase from 2000. The vast majority of these groups promote white supremacist beliefs, and range from skinheads living in urban areas to the KKK ,which is based largely in rural settings. It is difficult to pinpoint how many people subscribe to white supremacist views, because the Internet allows people to follow the movement under the cloak of anonymity. Leaders of the white supremacist movement are able to use their Web sites to reach a new subset of potential followers and push their racist rhetoric to the limit without outright calling for violence. Levin said one challenge in protecting Obama is that the identity of a potential attacker would likely be unknown -- a person who believes in white supremacist ideology, but decides to act as a lone wolf. Threats of violence are more likely to be found on Web sites that allow posters to remain anonymous. Most white supremacist leaders have been careful in what is posted on their Web sites, "hyper-aware that they are being watched," Potok said. But not all white supremacist leaders are mindful of their actions or care to be. Two months before the election, American National Socialist Workers Party head Bill White posted a magazine cover on his Web site featuring a picture of Obama in the cross hairs of a rifle scope with a headline "Kill This N-----?" White is now in jail on unrelated charges that he "threatened use of force against" a juror who had helped convict another white supremacist as well as several other charges of making threats to unrelated victims. Racism in the U.S. "remains a real problem" even though Obama won the White House, Potok said, and he predicted that hate groups will continue to grow during Obama's presidency. "I think we are in a very worrisome moment historically," Potok said. "I say that because there are several things converging that could foster the continued growth of these groups: continuing high levels of nonwhite immigration, the prediction by the Census Bureau that whites will lose their majority in 2042, the tanking economy, and what is seen as the final insult, the election of a black man to the White House." Levin noted that it is common knowledge the U.S. Secret Service is taking great measures to protect Obama (who began receiving coverage in May 2007, the earliest point ever for a candidate in a presidential campaign), and emphasized it is a great challenge. "President-elect Obama is so used to a public presence, and being among people poses some real difficulties for his protection," Levin said.